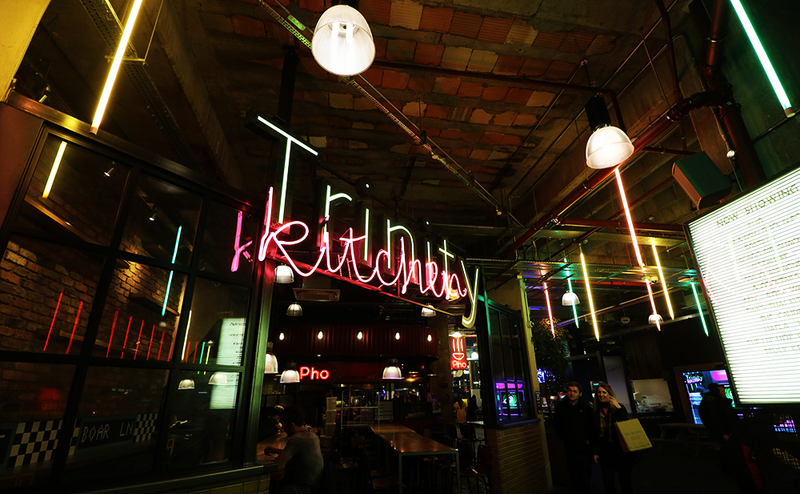 Trinity Kitchen is a great place to go with the pickiest of friends, everyone will find something they like here. 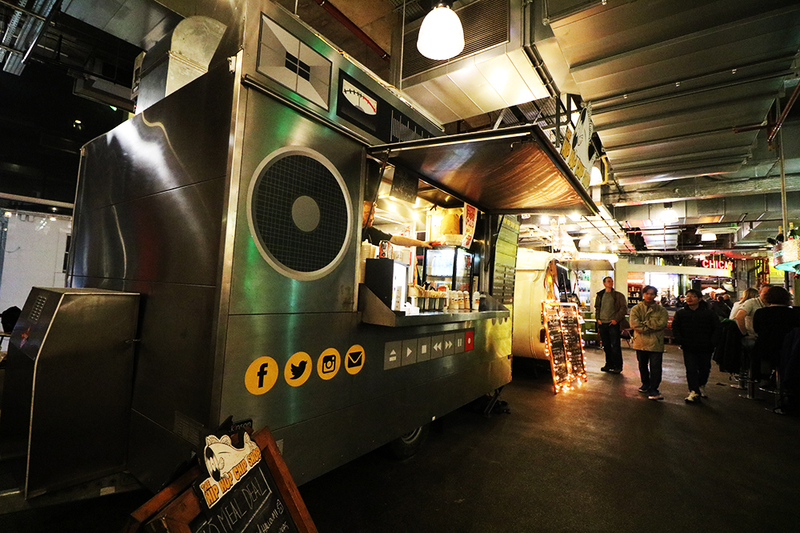 The fact that it's forever changing with the rotation of the street food vans means that you can keep going back again and again and never getting bored. So what does Trinity Kitchen have to offer us this month? 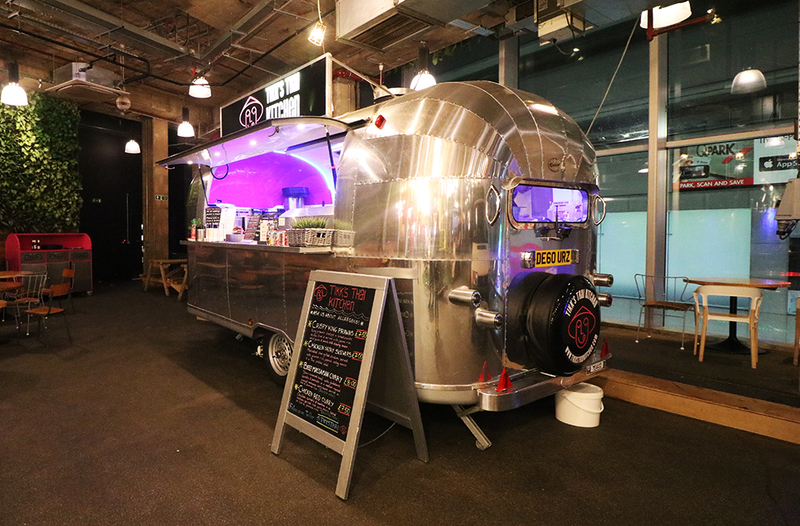 In a space age caravan type vessel they cook up authentic thai food following home recipes. 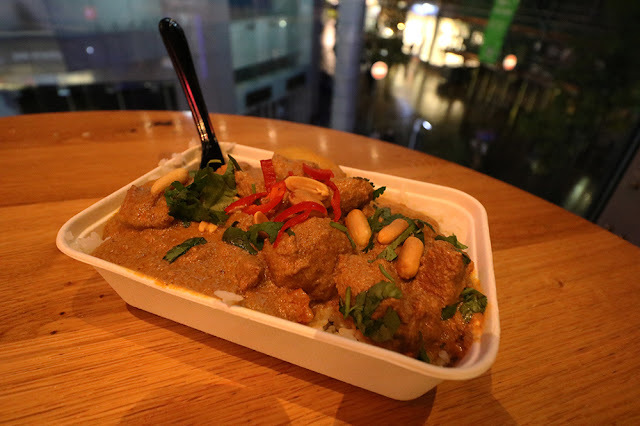 The chap and I shared the Beef Massaman curry (£8) which was rich and coconutty with a dash of spice. 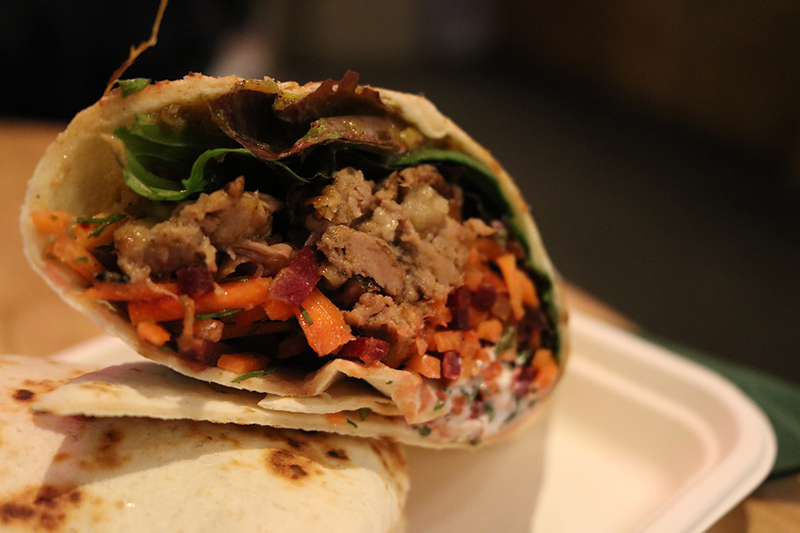 Portions are a good size and it's packed with beef, potatoes, carrots and dotted with peanuts, it's gluten free too. The Cauldron is like someone tried to breed country and city together and what came out of it was a beautiful fusion of nose to tail food. Featured on the menu are lamb shoulder, pork belly and ox cheek. All cuts of meat that 'used to be' associated with paupers food. They're often the cheaper cuts, fattier cuts and the cuts that usually require a long and slow cooking process to get the best out of them. Patience is most definitely rewarded with these cuts of meat, they are absolutely delicious and The Cauldron definitely did the lamb shoulder we ate remarkable justice. It was packed with flavour, it wasn't soggy, it was rich, well portioned and we agreed that it was probably the best thing we'd eaten from the street food offerings this month. 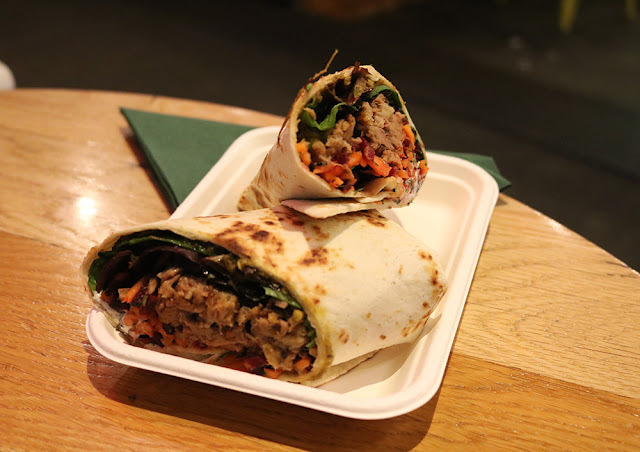 Hafla halfa are a firm favourite in Liverpool and have been voted in to the top burgers in the city and are famous for their fries. The chap reckons he's never seen anyone get as excited about having chips as I do, they're up their with my favourite foods, you can never have too many chips. Baring this all in mind and the fact that they are 'famous' in Liverpool for their chips there wasn't a cats chance in hell I wasn't going to order them. 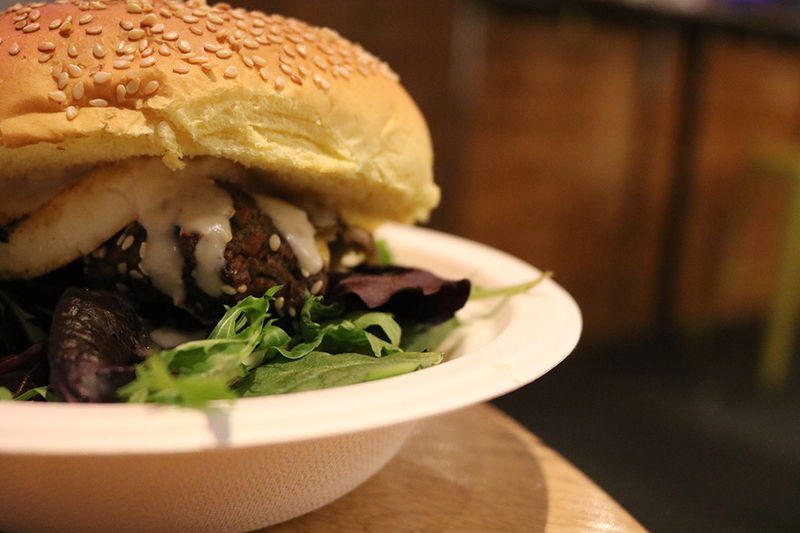 The same night that we had the lamb shoulder from The Cauldron we also visited Hafla Hafla so to order their lamb burger would be double dosing on lamb and so instead we opted for the falafel and halloumi burger. 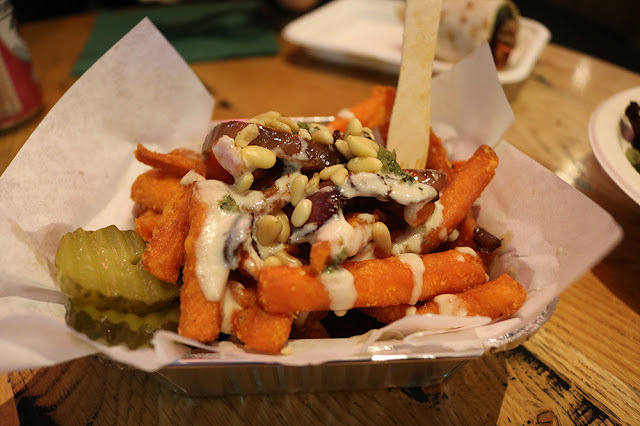 The chips (hafla hafla fries) were sweet potato fries (holding the sogginess) drizzled with tahini, toasted pine nuts and zhoug a type of Isreali chilli. They were so good the chap and I were fighting over the last morsels of them. With a best looking street food van award under their belt and people raving about them on Instagram, most specifically the battered halloumi, The Hip Hop Chip Shop drew my attention in. The guys that were running the show the night I visited were incredibly friendly and made me feel welcome despite me only hanging around for a minute or so, customer service counts. 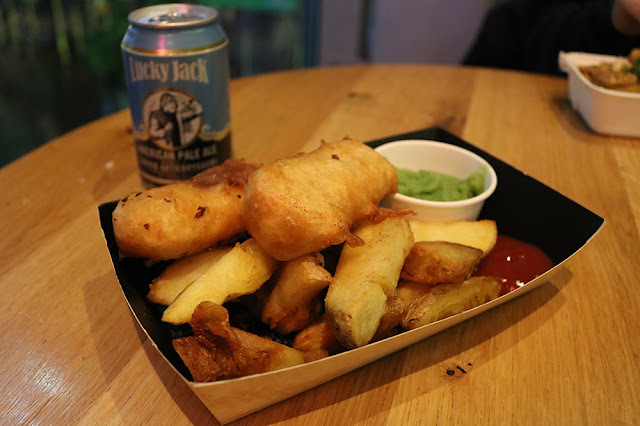 Clearly I ordered the battered halloumi, the meal included chunky chips mushy peas and a fisherman themed beer for a tenner. Being the geek that I am I was massively impressed that they found an on theme beer, it was pretty great tasting too. I naively thought I'd had all there was to have in crumpets, I've pretty much tried and tested every variety (Tesco are the definite winners in my books) and I've even had the piddly pikelet type too (although my mum calls all crumpets pikelets, maybe it's an old Yorkshire term). Truly Crumptious served to prove me wrong. Crumpets can be vegan and gluten free, standard I guess in today's society but they also offer up savoury and sweet versions. So I may have tried all the different varieties and brands of crumpets there are but I've always been fairly limited in my toppings sticking only with butter. 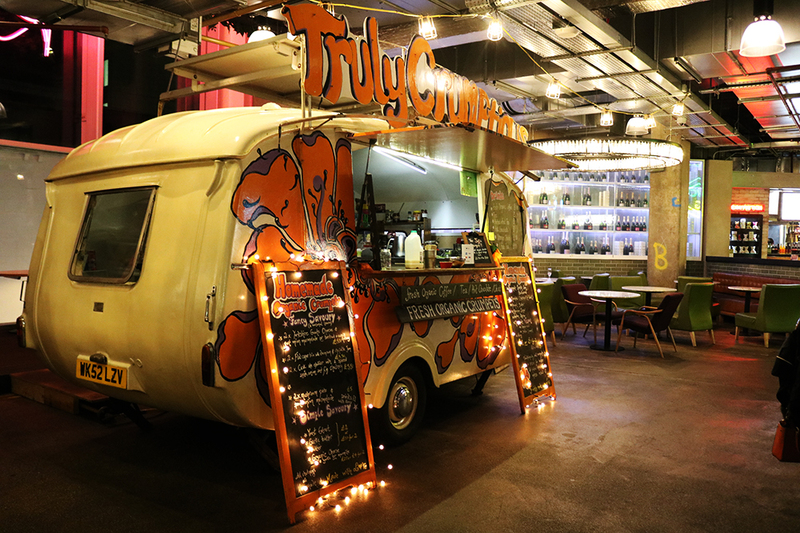 Truly Crumptious also make their crumpets by hand, there are no pre-bought packs in their van (which is cute old school caravan by the way) and they are toasted along with the many many toppings on offer. Having had my fill of savoury I opted for a sweet jaffa cake crumpet. 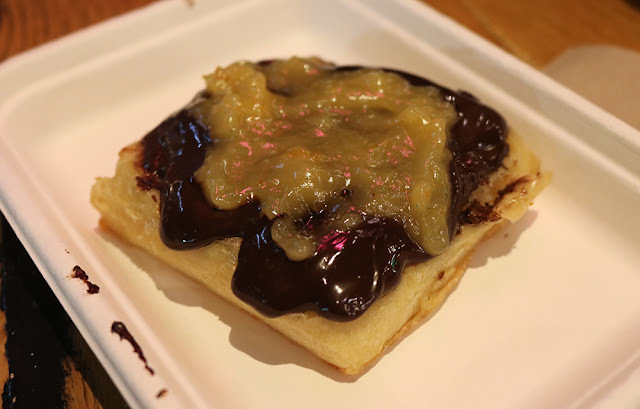 Topped with dark chocolate spread and an orange curd (plus butter) it was truly indulgent. That's your lot until the 11th December until they roll over again but be sure to pay 360 Champagne and Cocktails a visit for their rather imaginative cocktails (at reasonable prices). 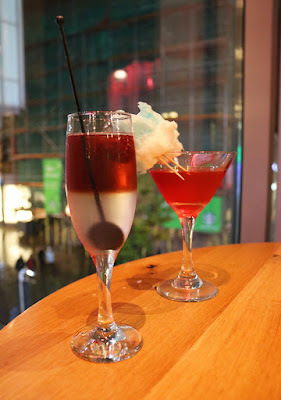 D and I treated ourselves to a Cupid's Kiss and a Candyfloss Martini (disclosure don't try dipping the candyfloss in your cocktail unlike a biscuit in tea is immediately disintegrates and falls to the bottom of your glass making an already sweet drink even more sweet... oops). *don't worry there are no pigeons and seagulls in Trinity Kitchen.